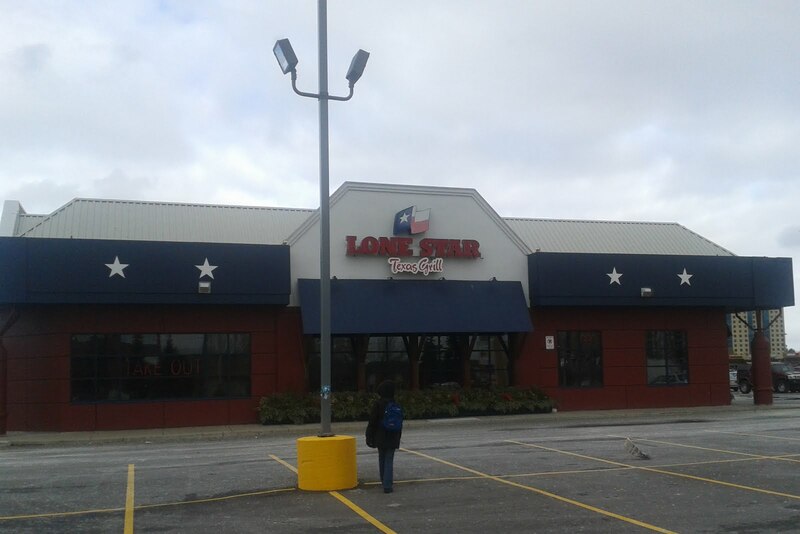 Last night I thought I would return to a restaurant I had not been to in a while, Lone Star Texas Grill (9301 Yonge Street, Richmond Hill). We had been here a couple of times, leaving not really excited about it, including my last review from 2010. We entered at about 6:30 PM to be greeted by 3 hostesses. One showed us immediately to our table. Again, like in 2010 asking us if we had been to Lone Star before. Of course we said we did, I let my wife do most of the small talk while we followed the hostess to our table considering, as a gentleman, I live by the old adage "Ladies first!" We were seated and left to consult our menues in the three quarters full restaurant. The menues seemed a little sparse considering they were pushing the fajitas and steaks while the sandwiches were buried on the back page at the bottom. There were only 7 sandwhices offered with 3 of the choices a variation on the burger. As well the "Po' Boy sandwhich that I had previously and other sandwiches had dissappeared resulting in fewer choices still. Our waitress soon stopped by to share the specials and take our drink orders. She quickley returned with our drinks and we were ready to order. The Order: 1 “Bubba’s” Smoked Brisket (Texas-style smoked brisket tossed in our Original Texas BBQ sauce and piled on a rustic bun) with fries and Pepsi and 1 The Ranch Burger (A juicy ½ lb. Mesquite-grilled burger topped with lettuce, tomato and onion) with Richmond Hill's finest water somewhat directly piped in. Our server brought by the usual Lone Star Texas Grill chips and salsa while we waited for our order. She also refilled my Pepsi glass two times (the last as the food was arriving). She was quick on the drink server and a just over fifteen minute wait for the food was understandable and still less than twenty minutes when I start wondering what the heck was going on. The Smoked Brisket sandwich was small in appearance with a bun that looked well handled while being cut in half. I had expected a hero (sub) size sandwich but instead received a hamburger sized sandwich. The brisket was decent but nothing to write home about. The fries accompanying the substandard sized sandwhich seemed freshly cooked by temperature and quite tastey compared to other pub style fries I've had in the past. The beef burger was o.k. put a little pricey at more than $11+ with no drink included. The burger was juicey and tangy as you would expect from a Ranch style infused burger. The fries were exactly the same temperature and style as the Smoked Brisket Sandwich. The only reall hiccup service wise was near the end of the of the evening when our server stopped by. We were just finishing up eating when our server stopped by to inquire if we would like refills on our drinks. We indicated we were fine and were just finishing up. To my amazement she took our glasses with ice and liquid still in them and dissapeared towards the kitchen. Really? It wouldn't of hurt to let us finish up? I was unsure if were being rushed by this tactic or whether it was a simple mistake. Rushed? There were still quite a few tables available at this point in her area and we had not been at the restaurant longer than 45 minutes. She did return after we finished eating to offer us coffee or tea and/or dessert, we politely declined and left. Overall Lone Star Texas Grill is staffed by high school servers with little experience. Sure they do have corporate training as they greet their customers in a friendly manner with the same techniques used over and over again (i.e. Have you ever been to Lone Star Before? asked when being led to the table). The food is decent taste quality but the portion size seems to have been cut and the prices thus don't really match what you get.